Swedish watercolor painter Gunnar Widforss arrived in California from Stockholm in 1921. 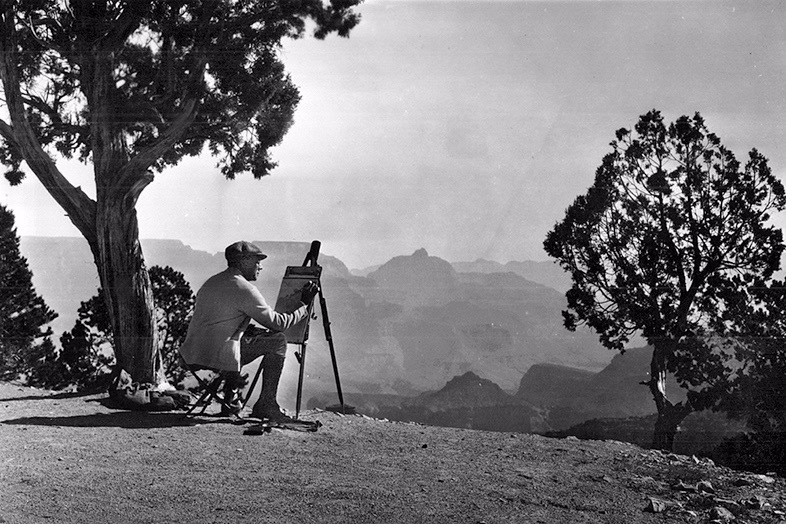 With the support and encouragement of Stephen Mather, first director of the National Park Service, Widforss became known during the 1920s and 1930s as "The Painter of the National Parks." He traveled throughout the West painting iconic scenes of America's national parks and other western landscapes. Sadly, Widforss died in 1934 at an early age, and today he is largely unknown, here in the United States as well as in Sweden. After ten years of preparation it is time to publish the Gunnar Widforss Catalogue Raisonné! 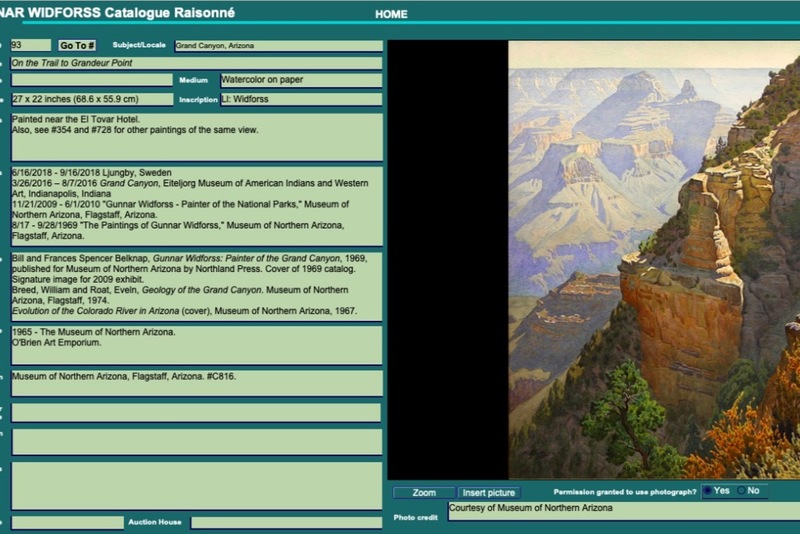 A catalogue raisonné is a comprehensive listing of an artist's life's work including not just the artwork but also supporting documentation, photographs, and etc. The catalogue will be published online using software called PanOpticon. Currently, I have more than 1,200 paintings cataloged that span Gunnar's career from his youth until the last paintings that he was working on prior to his death. The advantage of publishing a catalogue raisonné online is that it is a living document; it is easily updated and revised compared with a printed book. It is also widely available, and as you know a primary goal of my work has been to bring greater recognition to Gunnar’s work. 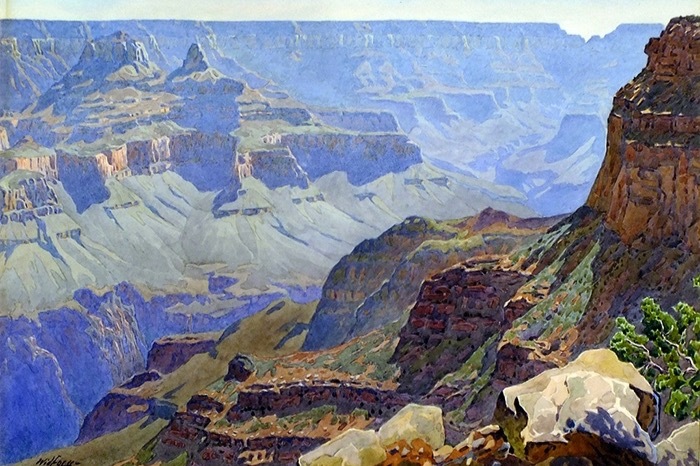 I am seeking your help to publish this very important document of Widforss' life and work that will help to bring greater recognition to this exceptionally talented painter who helped to promote America's national parks and is the Grand Canyon painter par excellence. The $38,000 raised by this campaign will go to the Gunnar Widforss Institute at the Museum of Northern Arizona. It will support the initial implementation of the online catalogue and establish an endowed fund that will ensure the maintenance and updating of the catalogue in perpetuity. The Museum of Northern Arizona is a 501(c)3 non-profit corporation and all donations are tax deducible. Please make a contribution today and help secure Gunnar's place in art history ! 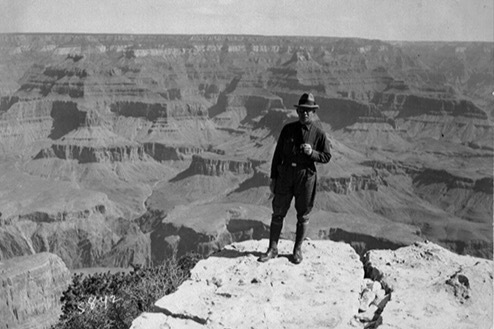 One hundred years ago Grand Canyon became the fifteenth national park in the United States. 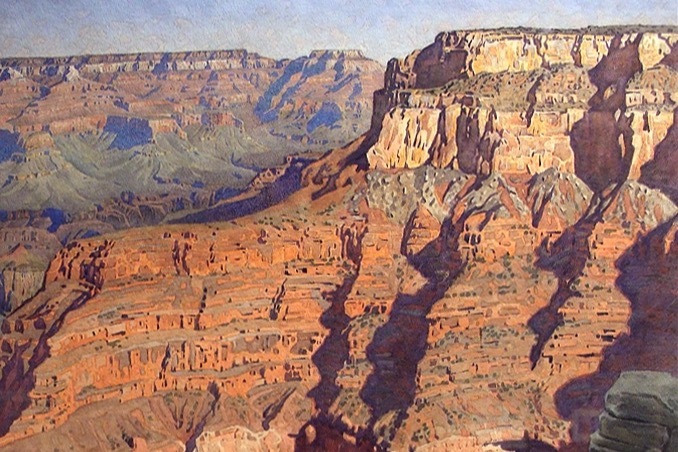 Today, more than the many other artists who have painted the subject, Swedish-American artist Gunnar Widforss is remembered as the Painter of the Grand Canyon. In the later winter of 1923, Gunnar Widforss was going into his third year of living in Yosemite Valley. It was a prolific period for him. He was producing the best work in his career and he was gaining great recognition in California. A chance, though inevitable, meeting with NPS Director Stephen Mather over breakfast led to Widforss’ next big challenge. Each man certainly knew of each other and each man had a great gift to give each other. Widforss could give visual branding to Mather’s nascent Park Service, established only seven years earlier, and its treasures. Mather gave Widforss an artistic challenge and greater recognition. That chance meeting over breakfast led Mather to commission Widforss to do some paintings in Zion National Park. The artist made two trips to Zion and in July of 1923 he made his first visit to the North Rim, a short jaunt in his Willys Overland Roadster. The rest, as they say, is history. Gunnar made it to the subject he is best remembered for and he fell in love with it. "Though I have heard hundreds of times about that place, it surpasses all imagination. I suppose you know it from the South Rim. Nothing I ever saw has impressed me any way in comparison. Simply wonderful, and I am sure that the future will give me opportunity to paint there as much as I’d like." By 1926 Gunnar was spending more time at the Canyon than in Yosemite and he was producing great numbers of paintings. He made many friends including ranger Mike Harrison and photographer Emery Kolb and was welcomed as a resident of the small village. "I hope some day to be remembered for my paintings of Grand Canyon." Excerpt from a letter written to his mother from Bright Angel Lodge, April 1925. Celebrate the centennial of the creation of Grand Canyon National Park and the role that Gunnar Widforss has played in our appreciation of this extraordinary landscape. Please make a contribution to the Gunnar Widforss Catalogue Raisonné Project to secure Gunnar’s legacy. We hope to publish the catalogue online this year. Our goal is to raise an additional $10,000 to realize that goal. I greatly appreciate the generous contributions that everyone has made so far. Many thanks to you. Yesterday, I was thinking - If only Gunnar knew, what would he think of our efforts to honor him? 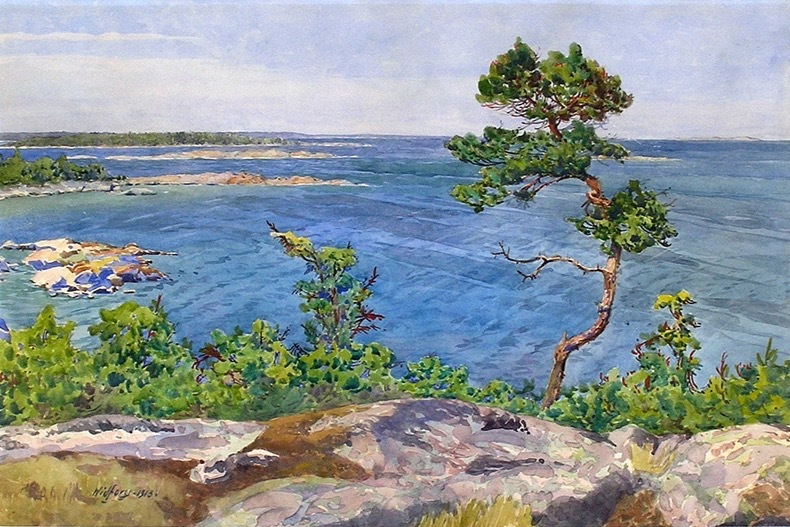 In January of 1913, Gunnar Widforss had his first solo exhibition at Hultberg’s Konsthandel in Stockholm. The exhibition included 8 paintings from Monaco and Cap Martin, 15 from Capri, and several scenes of the Swedish Archipelago. He sold almost half the paintings including one to Anders Zorn and two to the City of Stockholm. Please consider making a contribution that will help publish the Gunnar Widforss Catalogue Raisonné and preserve the remarkable artist’s legacy. 84 years ago today, November 30, 1934, Gunnar Widforss died near the El Tovar Hotel at Grand Canyon. He had just returned from a successful exhibition of his work at the Noonan-Kocian Art Company in St. Louis. It was during the depths of the Great Depression, though things were beginning to turn around. Internationally, like today, it was a time of growing nationalism and tension. A gallon of gas cost $0.10 and a loaf of bread cost $0.07. Gunnar had been surviving the effects of the Depression and did continue to sell his work, though at reduced prices. He did have a brand new car, a Ford Tudor that he had paid $500 for just a month earlier. In the tradition of many Swedish painters, Gunnar’s paintings were all about light and his love of Nature. 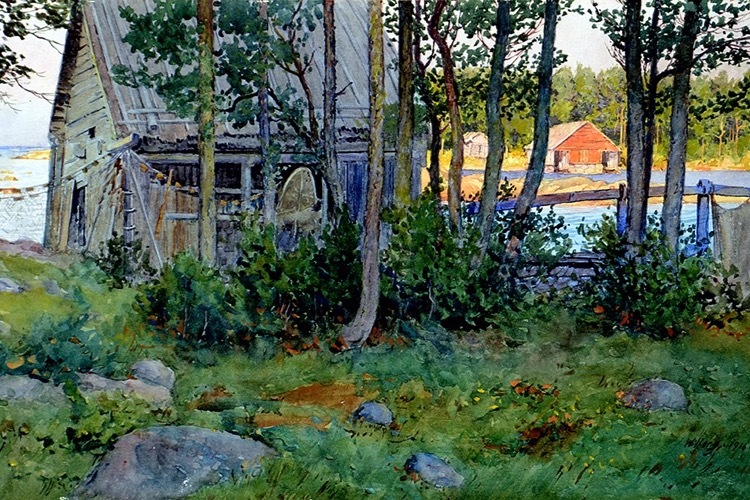 This one celebrates the wonderful light of summer in the Swedish archipelago. The Gunnar Widforss Catalogue Raisonné will be published by mid-2019. Please consider making a donation to preserve and celebrate Gunnar Widforss’ legacy.